I was working under a misapprehension to start off with. 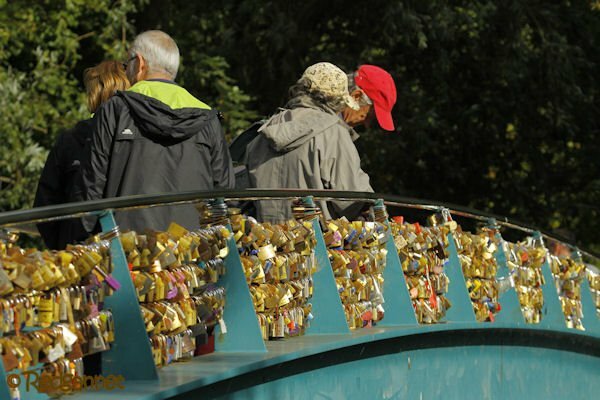 After receiving the advice, “Try looking from the lock bridge below the weir” I was expecting a scene with mill races and canal boats being raised against flow and gravity. 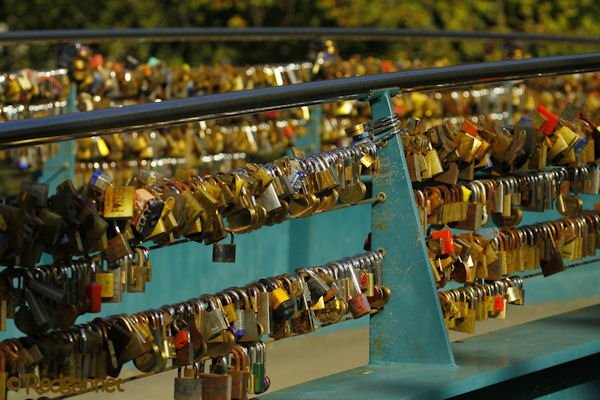 The lock bridge over the River Wye proved to have nothing at all to do with the Industrial Revolution of 18th and 19th century Britain, but was obviously popular in its own way with sweethearts visiting the quaint Derbyshire village of Bakewell. I was hoping to find a White-throated Dipper during a trip to the Peak District National Park, but had not had time to do my research, so was relying on the expertise of boutique owners in the picturesque village. 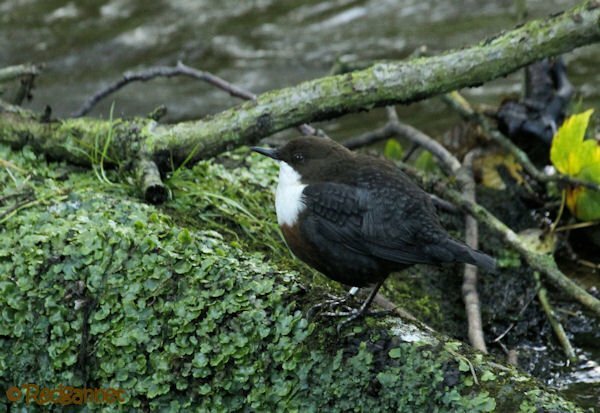 White-throated Dippers are typical of their family in that they like fast flowing rivers with protruding rocks. 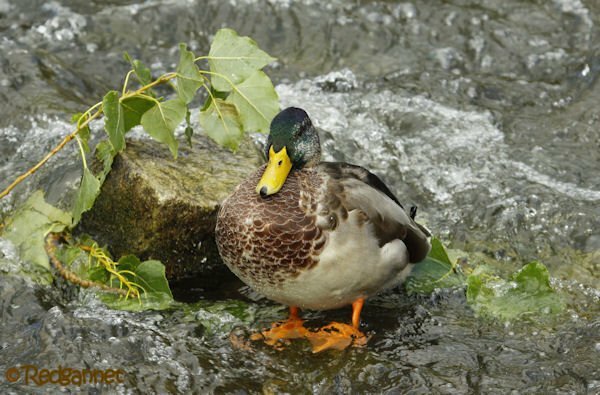 They rest on the rocks and step into the water, commonly submerging, to search for insects in the stream. 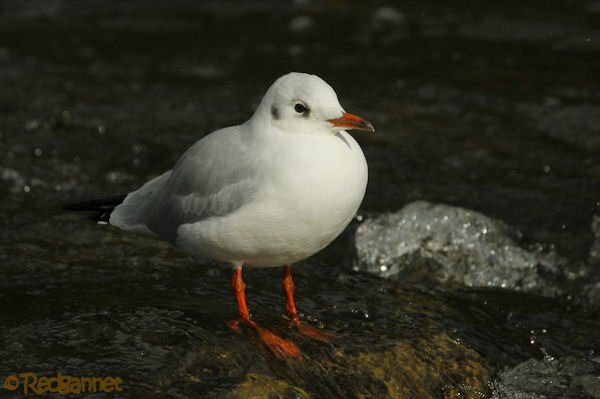 Either the characteristic bobbing motion, or the habit of dipping under the water may have contributed to their common name. The Lady Helen was helping today and I had given her instructions to scan the rocks, looking for a bird resting on any of them. The river was running a little high and there were very few rocks that broke the surface, but as suggested by the local expert, there were a few by the weir. Lady Helen warmed to the task and began pointing almost immediately. She has had considerable exposure to the wonders of the avian world, yet none of it seems to have made much of an impression. I can never quite fathom whether my powers of engagement are really that weak or if she is simply being obtuse. Sometimes, I think she is having me on. Surely, she is doing this on purpose just because I wouldn’t buy her that parable on a bit of driftwood. Charming though Bakewell may be (it has also given its name to a delicious pudding (not a tart apparently, that is another misapprehension that was set straight today)), it did not come up with the goods re; the dipper. So I hooded the sugar-rich Lady Helen and bundled her back into the car, headed for the River Derwent. You can’t throw a stick in the Peak District National Park without hitting something pretty. I had dropped Lady Helen back at the hotel as she doesn’t like being hit with sticks.The scenery is stunning with dales, moors, streams and dry stone walls. It was so fetching that I almost forgot my mission for the day. 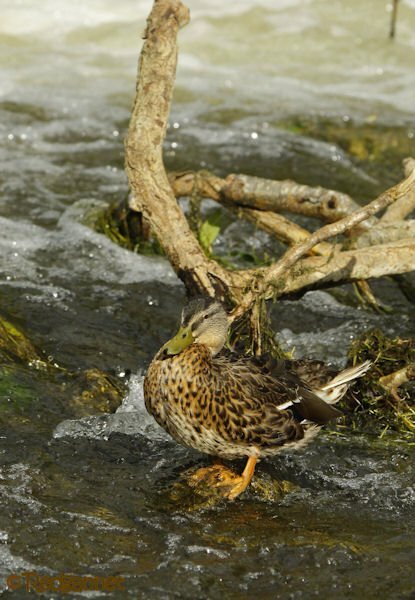 It was only a small movement heading upstream that brought me back to the task at hand. 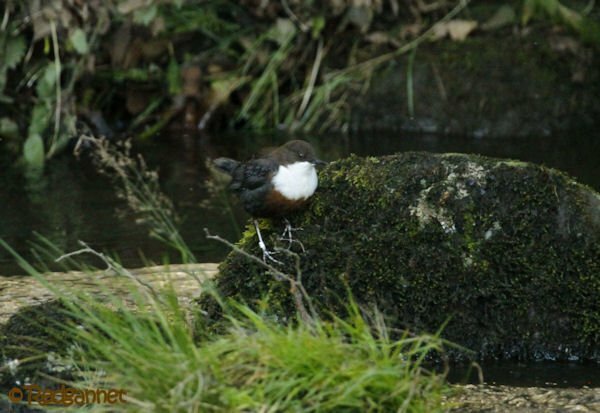 The bird appeared to have settled just a few meters upstream on one of the very few rocks that showed above the surface. I crept along the high bank and peeped over. 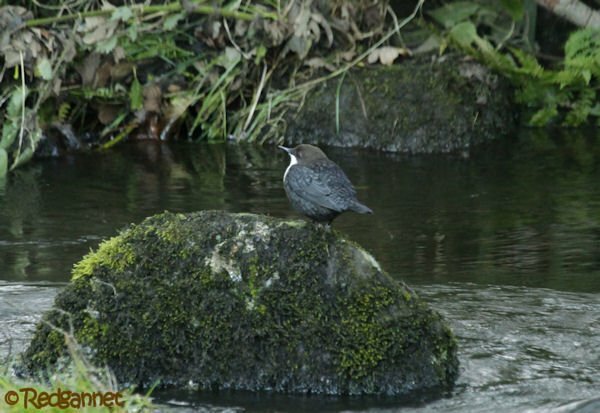 Dipper! It was late in the evening by now and trees overhung the river casting it into deep shadow. 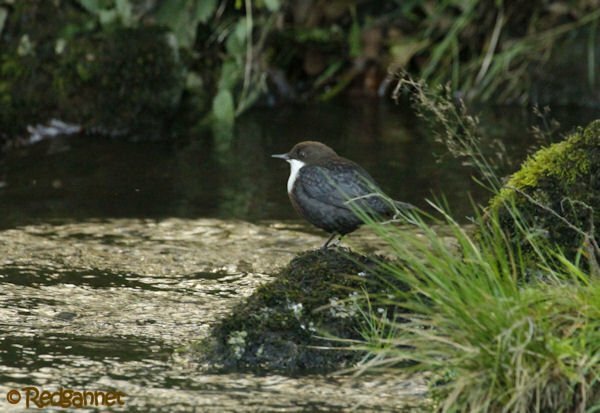 This was my first English dipper and it was going to have its picture taken. I have sightings from Scotland and Europe, but not from England, so it wasn’t going to get away without an attempt at an image. The ISO rating had to be hiked right up and the aperture opened as wide as it would go. Even so, the images were shaky, so I had to get down on my belly in the wet grass and lean on my camera bag to get a useable shot (for better photos, please refer to Francois Portmann’s post). Your economy of words still speaks expressive volumes. Most of us can surely sympathize! Well done on adding it to your “England” list! We managed that last year! A bit further north, though! Where Are You Birding This Third Weekend of December 2017? I and the Bird: What is a Wren?